Reform of the corporate income tax is shaping up to be one of the big issues facing Congress in 2017. Republicans are pushing for big cuts in the corporate tax rate. Most observers seem to assume that conservatives and progressives will be at swords points over those cuts, but they should not be. There is a strong progressive case for sharply lowering the corporate income tax, or better still, abolishing it altogether. On the Republican side, President Elect Donald Trump has proposed lowering the top corporate tax rate from its current 35 percent to 15 percent while eliminating most loopholes. House Republicans have proposed a 20 percent top rate, also eliminating some important deductions and preferences. In the Senate, many Democrats, who retain the power to filibuster tax reform legislation, are digging in their heels against the corporate cuts. Progressive superstar Senator Elizabeth Warren of Massachusetts is leading the fight. 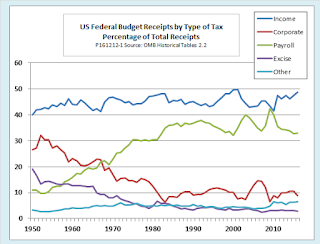 In a recent New York Times op-ed, she wrote, “Congress should increase the share of government revenue generated from taxes on big corporations—permanently.” She points out that in the 1950s, the corporate tax accounted for more than 30 percent of all federal revenue, compared to less than 10 percent today (see chart). She is wrong. Progressives should stop trying to recreate the glory days of the corporate tax. Instead, they should join forces with conservatives to implement a comprehensive tax reform program that includes deep cuts in the corporate tax, or even its entire elimination. Here are three reasons why. True, corporations as legal entities have been granted the right to enter into contracts and the obligation to make tax payments to the Treasury. Legal forms aside, however, the economic burden of the tax (the incidence of the tax, as economists put it) must ultimately fall on corporate stakeholders, principally shareholders and workers. 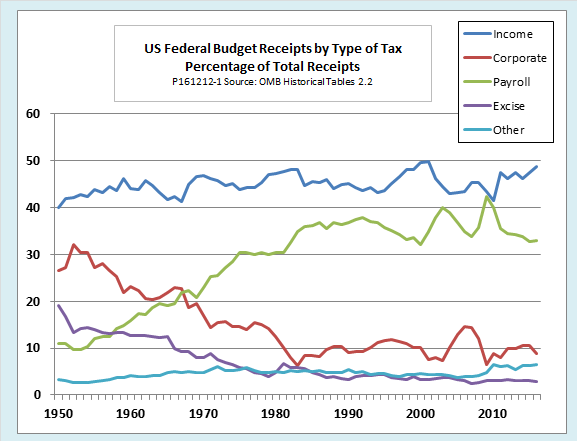 Allocating the economic burden of the corporate income tax has proven to be a difficult and controversial exercise, as a report available from the Urban Institute and Brookings Tax Policy Center details. Economists trying to quantify the distribution of the tax burden among stakeholders face not only the usual difficulties of finding the right data set and specifying the right econometric model, but other problems, too. One factor that complicates the analysis is the degree to which an economy is open to trade and capital flows. The earliest estimates of corporate tax incidence for the US economy, which were conducted in the early 1960s, at the dawn of the era of globalization, concluded that the tax burden rested almost entirely on shareholders. As the economy became more open to trade and financial flows, however, that changed. Capital is much more mobile internationally than labor. If one country imposes a high corporate tax rate while others have lower rates, investors move their capital to low-tax jurisdictions. That means less investment per worker, and therefore lower wages, in the high tax countries. The downward pressure on wages shifts part of the burden of the tax to workers. That effect is especially relevant to the United States, which has the highest statutory corporate tax rate of any major economy. Estimates of just how much of the tax burden is shifted to workers vary widely. Influential studies cited in the report from the Tax Policy Center conclude that workers bear 70 percent or more of the burden. At the other end of the scale, the Tax Justice Network, in a report titled “Ten Reasons to Defend the Corporate Tax,” points to research suggesting a smaller burden on workers. A footnote in the report approvingly cites work by the Congressional Budget Office, which uses 25 percent for its estimate of the labor share. The degree to which the corporate tax is shifted to workers also depends on the time horizon. Because changes in the global pattern of investment happen only slowly, in the short run, an increase in the corporate tax rate is likely to be absorbed almost entirely by shareholders. However, any shift of the burden to workers, via outflows in capital, persists once it becomes established. The lag is important because, while economists tend to focus on the long run, politicians, with their eye on the next election, and corporate leaders, with their eye on their next quarterly report to shareholders, tend to focus on the short run. For example, the report from the Tax Justice Foundation notes that corporate executives typically behave as if tax burdens fall on shareholders. “Would they spend so much time and energy finding clever ways to dodge tax,” the report asks, “if they believed that taxes didn’t fall ultimately on their shareholders, to whom they are accountable?” The time lag in tax incidence answers the question. Even if the burden of the corporate tax were shifted entirely to workers in the long run, executives would resist the short-run effects of any corporate tax increase. The fact that a significant part of the burden of the corporate tax is born by workers should give pause to the progressive supporters of that tax, even though no one can be certain exactly what its incidence is. Supporters can, of course, hope that the true incidence on workers is near the low end of the range of estimates. They can spin the research and cherry pick their citations to support their hopes, as the Tax Justice Foundation report does, but simply ignoring research whose conclusions you don’t like doesn’t guarantee the validity of the research you do like. Instead of playing econometric Russian roulette with estimates of corporate tax incidence, then, shouldn’t progressives look for a better tax—one for which the burden is more certain actually to be borne by the corporate shareholders they want to pay it? Fortunately, there is just such a tax. As background to explaining the better way to tax corporate profits, we need to understand the issue of double taxation. Double taxation occurs when corporate profits are taxed once when earned by the company itself, and again, as individual income, when they are paid out as dividends or realized as capital gains. The US tax code as it stands now imposes a high rate of tax at the corporate level, and then mitigates the double taxation by taxing the dividend and capital gains income of individual shareholders at preferential rates, about half that charged on other income. In contrast, other advanced countries not only tax corporate profits at a lower total rate, but also collect less tax at the corporate level and more at the individual level. For the United States to match their lower corporate rates would sharply decrease incentives for outflows of investment, even if the lost revenue were recouped by raising individual income taxes on dividends and capital gains. That would, in turn, reduce the incidence of the tax on labor. In addition to bringing jobs back by slowing investment outflows, cutting corporate taxes while taxing investment income at the ordinary individual rate would have another effect—that of increasing the progressivity of the tax system as a whole. Some progressives just don’t seem to get this. As one of its ten reasons to love the corporate tax, Tax Justice Network argues that “the corporate income tax is one of the most progressive taxes a state can levy,” and that “the corporate tax curbs inequality and protects democracy.” They base that conclusion on the fact that corporations are predominantly owned by the well off—in the United States, the wealthiest ten percent of people in the country own an estimated 90 percent of corporate stock and the top 1 percent own over half. But focusing on the distribution of ownership misses the point. Yes, it is true that cutting the corporate tax in isolation would make the tax system less progressive, but that is not what serious reformers want. Most of them, instead, advocate a package that cuts or even eliminates the corporate tax but taxes dividends and capital gains at the same rate as other individual income in order to achieve at least approximate revenue neutrality. Taxing profits more highly at the individual, and less highly at the corporate level would unambiguously increase tax progressivity. That is true, first, because such a reform would reduce the share of the corporate tax that is shifted to labor, and second, because stock ownership is so highly concentrated at the top of the income distribution. If the corporate rate is zero or very low, then people—and here we are talking mostly about wealthy individuals—could leave their earnings inside the corporation and defer paying personal income tax on them indefinitely until the corporation pays them a dividend at a date of their choosing, or perhaps never. Those corporate profits will not be effectively taxed over that period. A plan jointly advanced by Eric Toder of the liberal-leaning Urban Institute and Alan Viard of the more conservative American Enterprise Institute addresses the tax shelter problem directly. Toder and Viard propose that any reduction of the corporate tax be offset by an “accrual” or “mark-to-market” tax, at the full ordinary rate, on shareholder income. Mark-to-market income would be calculated as the sum of dividends and net accrued capital gains, that is, the change in the market value of shares during the year. Gains and losses would be smoothed to reflect share price volatility by allowing deductions for losses in one year to offset profits in a previous year. In that way, shareholders would pay tax on the earnings of the corporations they own whether or not they were paid out as dividends, and whether or not they sold the stock and realized their capital gains. Conservatives regularly claim that cutting corporate taxes would spur growth, but progressives tend to be skeptical. In part, that is because the conservative argument too often invokes a trickledown effect. The claim is that giving corporations more after-tax profit will spur them to invest and create new jobs. Even if they do not invest, and just pay out the profits as bonuses and dividends, more spending by the rich will create jobs indirectly. When the case for corporate tax cuts is framed that way, I am skeptical, too. However, the argument for the type of reform discussed in the previous section in no way depends on a trickledown effect. It would increase after-tax income of corporations but, under the mark-to-market principle, it would increase taxable personal income of shareholders by the same amount. It would be revenue neutral, or nearly so. Even a revenue neutral reduction in corporate taxes would have a beneficial effect on growth because, as things stand now, the total economic burden of the corporate tax substantially exceeds the revenue it raises. Economists call that the excess burden of the tax. Progressives often underestimate the true economic burden of the corporate tax by pointing to the many firms that pay little if anything, despite high profits and the high statutory tax rate. The Tax Justice Network report includes a long list of corporations, including General Electric, Verizon, Boeing, and others, that pay no taxes at all. What they gloss over, though, is the fact that the tax avoidance strategies these corporations use are far from costless. Consider a hypothetical example. Suppose that if your corporation paid taxes at the full statutory rate, it would owe $35 million in tax on $100 million in profit, for a net income of $65 million after tax. By changing your product line, moving your corporate headquarters, and using more tax-deductible debt instead of equity financing, suppose you can cut your taxes to $10 million. Unfortunately, taking those measures incurs administrative costs of $12 million and cuts your revenue by $8 million. You end up with after tax income of just $70 million, even though the government only gets $10 million in revenue. Yes, that’s still worthwhile in the sense that you are $5 million better off than if you had just paid your taxes. But what is the accurate measure of the burden that the US corporate tax system places on your company? Is it the $10 million, or 5 percent, that you pay on your remaining $80 million in before-tax profits, or is it 30 percent—the bite that $10 million in taxes plus $20 million in tax avoidance costs takes out of your original $100 million? Obviously, it is the latter. We can’t be sure what corporations would do if they could cut back on the administrative resources and executive energy they now waste on costly and unproductive tax avoidance strategies. They might expand, they might pass cost savings along to consumers through lower prices, they might bring jobs back home that they had previously sent offshore for tax reasons, or they might just pay higher dividends, thereby increasing tax revenue under a regime in which dividends were fully taxed. But why would progressives not welcome any one of those outcomes? To sum it all up, it is time for progressives to end their love affair with the corporate income tax. That tax is not well targeted at corporate shareholders. Too much of its burden spills over onto workers—even the lowest estimates of the labor share are too high, since there is a better alternative. The alternative is to eliminate the corporate tax altogether and tax shareholder income, measured on a mark-to-market basis, at the full individual rate. On top of that, in addition to being poorly targeted, the corporate tax undermines economic growth by encouraging wasteful tax avoidance strategies. To be sure, none of this means that progressives should simply sign off on GOP reform plans, either the House version or Trump’s own. Both of those plans cut the top corporate rate while retaining preferential treatment of dividends and capital gains earned by shareholders. As a result, despite various other tweaks to deductions and preferences, both of the GOP plans result in net reductions in total revenue: $1.7 trillion over 10 years for the House plan and $2.6 trillion for the Trump plan. Those prospective revenue losses in the Trump and House plans should give Senate Democrats some bargaining power, since Senate Majority Leader Mitch McConnell , along with some other Senate conservatives, has repeatedly expressed the view that tax reform should be revenue neutral. A bipartisan compromise could achieve revenue neutrality while sharply cutting the top rate for the corporate tax as long as it also reduced or eliminated the preferential rate on dividends and capital gains. Moving toward mark-to-market treatment of corporate profits would also increase revenue while cutting tax rates at the corporate level. Given the diversity of political views and the complexity of procedural rules, there is no guarantee that of any bipartisan consensus on tax reform in the immediate future. However, the balance of power in the Whitehouse and Congress that will prevail in 2017 will not last forever. Even if immediate compromise turns out to be impossible, progressives should begin to rethink the kind of tax system they would like to see when and if they are able to enact a plan of their own. In my view, the ideal toward which they aim should include complete elimination of the corporate tax while recouping the lost revenue through full mark-to-market taxation of corporate profits paid to, or accruing to, individual shareholders. Using mark to market for stocks would tend to disfavor them over other investments if they are also not marked to market, from private ownership to real estate. Volatility would also mean high taxes when high and losses when low penalizing them more. And since something like 60% to 80% is in tax deferred accounts anyway, not much would be collected anytime soon. An immediate step from current deferred gains to full market value would provide a one time windfall though.